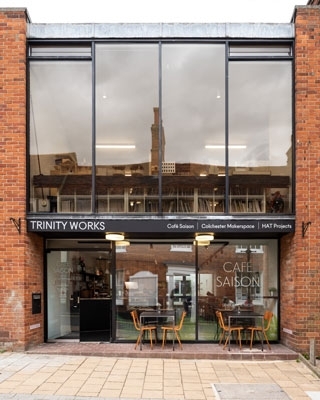 Trinity Works is developed and managed by HAT Projects. Repurposing a 1970s church designed by local architect Bryan Thomas, it is a centre for creative activity, reflecting our belief that town centres should be places of production, creation, learning and making new connections. At the heart of this is making a space for everyone to enjoy the best local food, great coffee and ultrafast wifi - a place for freelancers to touch down, businesses to meet, and families to relax. The best things happen over lunch! The former church was converted in a light-touch, low-cost fashion, working with local trades and managed by HAT from their previous offices a few metres down the road. Trinity Works opened in July 2018.